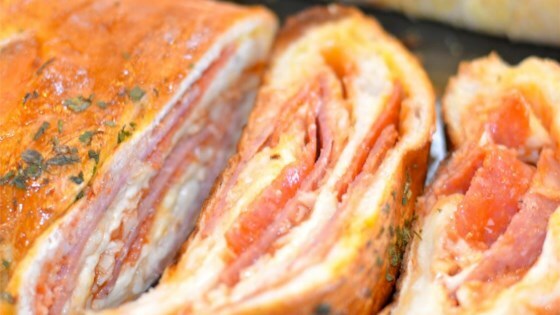 "This is a baked sandwich using frozen bread dough, meat, and cheese. My picky eaters love this for an easy weeknight meal and it's great served with a soup. My family fights over the leftovers!" Heat a large skillet over medium-high heat; cook and stir sausage until crumbly, evenly browned, and no longer pink, about 10 minutes. Drain and discard any excess grease. Pat out bread dough on an ungreased baking sheet, to 3/4-inch thickness. Lay salami, ham, and American cheese slices in center of dough. Sprinkle with mozzarella cheese, salt, pepper, and cooked sausage. Wrap dough to cover ingredients, pinching and sealing edges to prevent leakage; brush top with egg white. Bake in preheated oven until dough is baked and lightly browned, 17 to 20 minutes. A hearty and meaty, baked Italian turnover. The meat and cheese can be changed to suit your tastes. For a large crowd, I buy the package of 3 bread loaves and triple all ingredients. Serve with marinara sauce for dipping, or enjoy as is. I've been making this for years and everyone loves it! I add provolone and pepperoni to mine.Yummy!